Activision is putting together an exclusive web series for Call of Duty: Elite subscribers only. Activision's paid Call of Duty: Elite service will offer subscribers more than content directly related to gameplay. 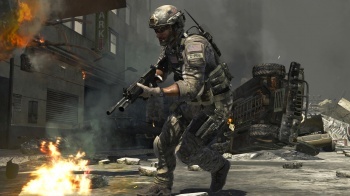 According to Activision Publishing CEO Eric Hirshberg, the company is also developing a Call of Duty web series only for the eyes of Elite participants. It's an indication that Call of Duty: Elite could be a broader service. Early details have showed it as a social, stat tracking, and gameplay video recording/uploading platform. Hirshberg told the Guardian: "We have engaged some top Hollywood talent to create linear video content that will be exclusive to Elite members. That content is inspired by Call of Duty." Activision probably got the idea for the series from Call of Duty fan film projects like Find Makarov which have already brought the franchise into the real world. This time though, the content will be official. Hirshberg didn't give any further details on the web series. He added that more details will be revealed once Activision has something to show "later in the year." The mention of "Hollywood" talent hints that it could be worth getting excited for, and might even expand the Call of Duty storyline.